* USAMRIID, according to the FBI, asked people to back up their computer and take it home ; GAO should solicit September-October 2001 emails to be provided from USAMRIID personnel who still have back-ups « CASE CLOSED … what really happened in the 2001 anthrax attacks? This entry was posted on March 16, 2011 at 5:24 am	and is filed under Uncategorized. Tagged: ** NAS anthrax study, *** 2001 anthrax attacks, *** Dr. Bruce Ivins, *** FBI anthrax investigation, Ivins' USAMRIID office computer. You can follow any responses to this entry through the RSS 2.0 feed. You can skip to the end and leave a response. Pinging is currently not allowed. This doesn’t seem to make any sense. Ivins did not have any “formula”. The relevance of the fact that some scientists or former scientists may have emails from the period is that it would help GAO reconstruct a timeline of events for mid to late September and early October. Certainly, obtaining the emails from a former employee would be a lot more efficient — taking just minutes. 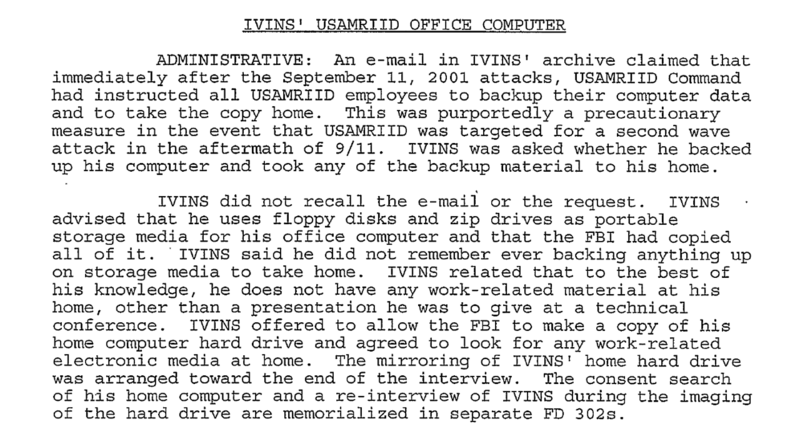 Whereas obtaining just Ivins’ emails from USAMRIID took two years. Some protocol to have with bio-security huh..-. Even in the eye of war. I can imagine what information is still floating around thats on a thumb drive, disc, notebook/diary… How much more was copied and transfered and carried off base and was everything accounted for? Nope… That would go for any “supposedly secure” facility with little to no accountability or “secure” ways of dealing with things.. From past track records just goes to show how well things are protected…; And for accountability everything filters to one person which is the president of the us. Need I say more…. It is true that William Patrick kept his secrets for weaponizing anthrax on a black notebook in his living room and famed Russian bioweaponeer shared a suite with the scientist coordinating with Anwar Aulaqi and convicted of sedition. I’ve previously posted the serial numbers of the Dell computers that Dr.Alibek and Dr. Bailey used that were just feet from Dr. Al-Timimi. Moreover, as scientists at the DARPA-funded Center For Biodefense have pointed out to me, data would be kept on the computers in the labs and so were available to the next researcher who walked in. But access to know-how does not loom particularly large — it is the reconstruction of a timeline for September and October using a triangulation of emails from the scientists working with Dr. Ivins.